Going Green: The James Scott Mansion, one of the city’s many crumbling historic structures, covered in ivy. Photo by Shannon Roxborough for Garden Variety. Garden Variety’s Founding Editor Shannon Roxborough, a Detroit native who lived there for 35 years, reports on the troubled Motor City’s efforts to chart a greener future. When the 19th century railroad bubble burst and an economic depression called the Panic of 1893 arrived, Detroit potato baron-turned-mayor Hazen Pingree pioneered using city lots to grow food for residents, a model that caught on in New York, Chicago, Boston and other cities across the nation. But that was before automobiles became the dominant local industry, and long before Motown became a poster child for violent crime, urban blight, a dwindling population, economic woes and political dysfunction—punctuated by the recent sentencing of former mayor Kwame M. Kilpatrick to 28 years in federal prison for corruption. What’s less known is the now-bankrupt city is turning over a new leaf by returning to an agrarian mindset, fueling hope that the once-booming town can reverse its downward spiral. 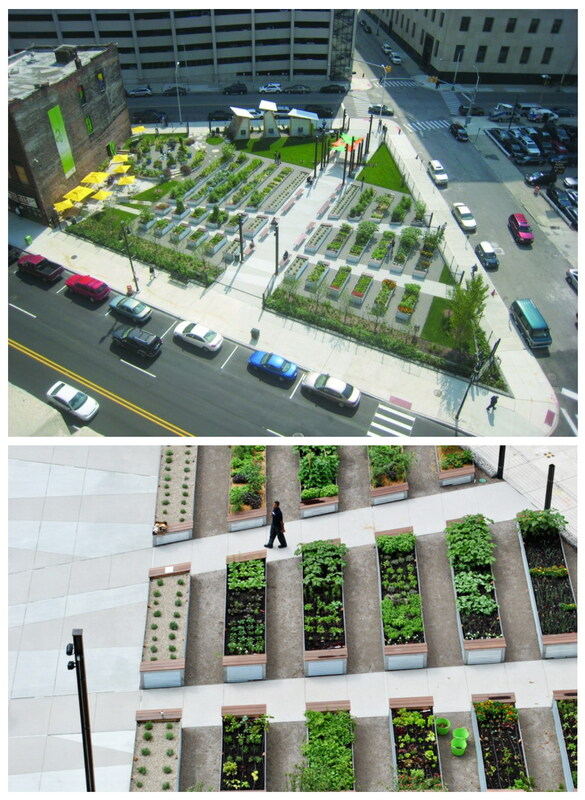 Aerial views of Lafayette Greens, a downtown urban garden and green space designed by accomplished landscape architect Ken Weikal for software firm Compuware. Photos courtesy of Compuware Corporation. The Eastern Market, the largest historic public market district in the U.S., buzzes with energy not seen since produce, meat and spice merchants first fanned out over its three square miles more than 100 years ago. Ambitious entrepreneurial ventures like Hantz Farms aim to turn some of the thousands of acres of abandoned inner-city land into profitable urban farms. Michigan State University has plans to build a $100 million, 100-acre urban-agriculture center that will put Detroit at the forefront of global research on city-based farming—focused on vertical growing in multi-story buildings, innovative energy production and water conservation. And with hands-on support from individual and groups like The Michigan Urban Farming Initiative, a nonprofit committed to using city agriculture to combat income inequality, as many as 2,000 community gardens now dot its nearly one-third empty 139 square miles, positioning Detroit as an unlikely leader of the urban garden movement. Deborah Silver’s recent work in downtown Detroit. Clockwise, from upper left: A classic verdigris container adorned with millet, dry twigs, broom corn, eucalyptus, milkweed pods and dried perennial stem and planted with winter-hardy cabbage and kale; a row of round pots with a similar arrangement; a low-profile wide white planter filled with dusty miller and cut green millet, topped by a moss dog focal point (all outside Chase Tower); a row of trees along Woodward Ave., the main drag, decorated for fall. Photos courtesy of Deborah Silver & Co. But finding alternative uses for now-empty land and increasing the city’s green space are only a small part of the total picture. 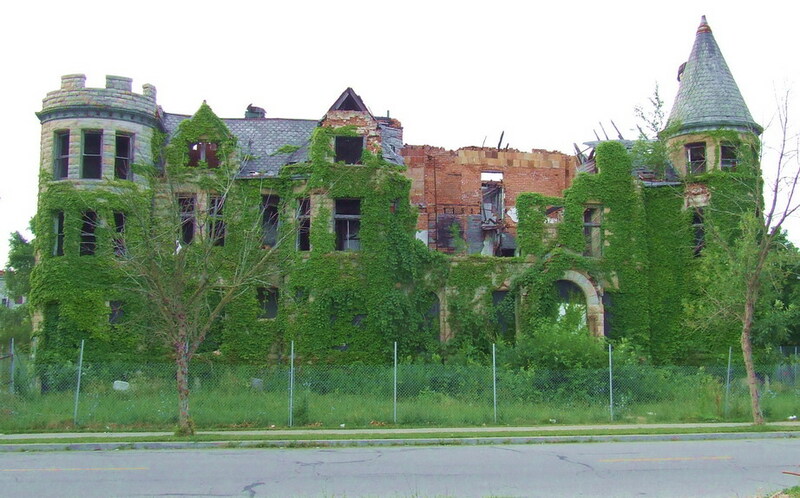 Eventually, Detroit will need to address the serious social, economic and political issues that have plagued it for decades and the city’s citizens must do their part to help. Not everyone is convinced that will happen. It doesn’t help that the staunchest opponents, both residents and city officials, see large-scale urban farming efforts as a land grab, with some going so far as to call it as a form of “modern-day slavery.” They say proposals are a guise to buy land cheap and later develop it. Others argue that even with an abundance of unused lots, vacant, city-owned land is too valuable to sell for a pittance to use for agriculture instead of rebuilding residential or commercial property, which would contribute more to city income and restore lively urban streetscapes. The diverging sentiments reflect the realities in this place of contrasts—at once filled with hope and mired in hopelessness; well acquainted with exhilarating highs and depressing lows—marked by stark racial and class divisions, frequent political squabbles and often competing visions of the future of the city. Gary Williams, a public school teacher who has witnessed four decades of ups and downs in Detroit along with more than a few false promises of rebirth, is cautiously optimistic. But the town they are working to improve has a lot of catching up to do. And only time will tell if Detroiters will learn to strike a balance, allowing the seed that has been planted to blossom into a prosperous, livable city rooted in activism, environmentalism and a strong sense of community or if it will stifle its growth, adding yet another chapter of unfulfilled dreams to its long history of making comebacks. To learn more about Detroit’s green renaissance or to get involved with a trowel, shovel or checkbook in hand, visit The Greening of Detroit at greeningofdetroit.com. Shannon Roxborough, the founding editor-in-chief of Garden Variety, has been a freelance journalist and writer for 24 years—acting as a magazine correspondent, newspaper columnist, book ghostwriter and online and print editor along the way. His writings and research have appeared in numerous leading regional, national and international publications and Web sites, including, The New York Times, Newsweek, Money, GQ, Southern Accents and The Christian Science Monitor. He grew up in Detroit fascinated by his mother’s backyard kitchen garden and now helps his wife, Angela, an avid gardener and soon-to-be small specialty grower, tend to their edible and ornamental plantings in Zone 6b. He loves trees, shrubs, flowers and fresh vegetables and herbs, but hates weeds with a passion. This entry was posted in Community Gardens, Edible Garden, Uncategorized, Urban Garden and tagged community gardens, Deborah Silver, Detroit, Detroit community garden, Detroit Garden Works, Detroit gardening, Detroit gardens, Detroit urban garden, edible gardens, Hantz Farms, Hazen Pingree, Ken Weikal, Michigan Urban Farming Initiative, MSU agriculture, The Eastern Market, The Greening of Detroit, urban agriculture, urban farming, urban farms, urban gardens. Bookmark the permalink. The lay of the land lends itself to plants. They have been adapting to everyplace on earth we cannot live. And feeding us when we get there. We can do much more to help our green friends grow in cities everywhere! Just curious as to why it costs $100,000 to garden in the city. Must they buy the land, first? Is it toxic? Having lived in the country all my life, I cannot imagine. Thank you for this. I am not from Detroit, but have read about your troubles in the news. So much pain. And yet, all that land is a sign of hope, of possibility. Too bad some are so cynical. I hope you can win them over. Detroit could be a great model for the rest of us. Thanks. I learned so many things. Great post, interesting to read what is being done in Detroit. Hi, from across the pond, yes we do receive a negative view of Detroit, but news of the greening has already reached these shores. I do wish you well with these projects and feel convinced that you have an exciting opportunity to show the world how we can adapt to a changed business and life environment, which will be a reality for all of us in the developed world, in the not-very-distant future. I need to to thank you for this great read!! I absolutely enjoyed every little bit of it. I have got you book marked to check out new things you post.